Wake up to a breathtaking view overlooking Eagle Beach, one of the Caribbean’s best beaches, and published as the “Dream Beach of the World”. Spend a romantic evening on the large balcony or terrace watching the orange and red sunset over the ocean. Each one of these 11 Deluxe Rooms has been beautifully refurbished and features chic, stylish and contemporary furnishings. Airy and spacious with two queen-sized beds, the combined bedroom and living room opens onto a large, oversized balcony. Pamper yourself in the bathroom with its spa-like feel, complete with marble countertops. 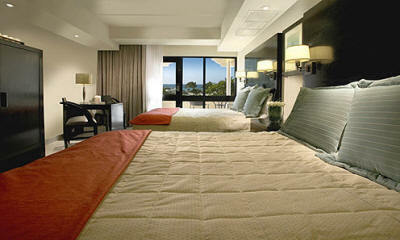 Deluxe Rooms can accommodate a maximum of three adults.